All Hallows Eve is the one of the oldest holidays still celebrated today. It is one of the most popular holidays. Many people celebrate Halloween without knowing its origins and myths, the history and facts of Halloween make the holiday more fascinating. Some see Halloween as a time for fun, putting on costumes, trick-or-treating, and having theme parties. Others view it as a time of superstitions, ghosts, goblins and evil spirits that should be avoided at all costs. Celebrating Halloween is a preference that is not always viewed as participating in an evil holiday. It is often celebrated with no reference to pagan rituals or the occult. Halloween is the last day of the Celtic calendar. It was originally a pagan holiday, honoring the dead. It was referred to as All Hallows Eve and dates back to over 2000 years ago. I recently heard that there is no shortage of vocations in the Catholic Church—in the United States or any place else. What we are seeing is a shortage of vocational discernment. Not enough people ask themselves what God wants them to do with their lives. Discernment—not recruitment—should be central to vocations efforts today. And personal vocation should be at the heart of it. First is the common Christian vocation, which comes with baptism and is shared by all members of the Church. It consists in the commitment of faith and what follows from it: loving and serving God above all else, loving and serving neighbor as oneself, and collaborating in the redemptive work of Christ, which is the mission of the Church. The second meaning is state in life. A "state" puts some flesh on the bones of the common Christian vocation. It is a broad, overarching commitment to a particular Christian lifestyle. As such, a state in life sets someone choosing it on a path that will shape his character through the countless choices and actions required to follow it to the end. The clerical life, the consecrated life, the state of marriage, and the single lay state in the world are states in life. Third is personal vocation. It is the unique combination of commitments, relationships, obligations, opportunities, strengths, and weaknesses—understood as representing God’s will—in and through which the common Christian vocation and a state in life are expressed by someone (priest, religious, layperson) trying to know and live the life God has in mind for him. It is the singular, unrepeatable role in his redemptive plan that God intends for each of us. "Every life is a vocation," Pope John Paul II says. And so it is—a unique, personal vocation. What does vocation discernment mean? 1. When you hear the Word of God, does it make you want to share it with others? 2. Do you find yourself more uplifted when you speak of spiritual things versus holding a full-time job in the world? 3. Have you considered religious life before? 4. Do you like to serve others? 5. Have others ever told you that you should become a religious Brother? 6. Do you find that you are different from the others and have been told so? 7. Do you feel that while you are in the world, you are not of the world? 8. Are you detached from the worldly ways of fame, pleasures, wealth, believing that there is more to life then what can be gained? 9. Do you have a natural inclination towards doing charitable works? 10. Has your mind been preoccupied with the fact that you must now make a major decision regarding your future, either to serve God or not? If you have answered "yes" to a few of the above questions, you may have a calling to the religious life. With an increase number of "yes" as an answer to the questions, there is a greater likelihood that God is calling you to the religious life. To follow-up on discerning if you have a calling, sit down with one of the Marianists Brothers. The Brothers of the Province of Meribah are hosting, “Operation Fiat" on November 3rd at Kellenberg Memorial High School. This vocation program occurs in the fall and the spring. Evening Prayer will begin at 6:00 PM in the Chapel. This fall gathering is for young men who are discerning a vocation to the religious life. Join the Brothers for great food, rich prayer, inspirational music, and compelling words as you grow in your courageous conviction to serve Christ, His Mother and the Church. "Ours is a great work, a magnificent work. If it is universal, it is because we are Missionaries of Mary, who has said to us [as to the servants at Cana]: "Do whatever He tells you." It is so amazing that when we lay down our lives for God, what He gives us is infinitely greater than what we have had to sacrifice. He favored an image of the Church as the “mystical Body of Christ,” which was unusual in the nineteenth century. The union among members was based also on the reality of Mary’s maternity: she was mother of Christ and of the members of Christ’s mystical body. The Marianist life is more about who we are than what we do. This means being a Brother first. We commit ourselves to grow in holiness and to help our confreres become more Christ-like. 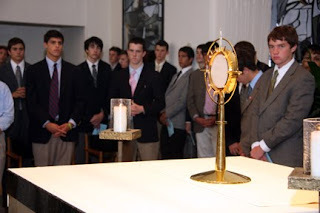 We understand that we have the responsibilityy for giving public witness to God's saving presence in the world and to the aspiration of Blessed Chaminade that men will realize that the Gospel is just as practicable today as it was in the early Church. We devote ourselves with energy and enthusiasm to the apostoloiic work of our communities. What is a Marianist Brother? A Marianist Brother lives his total consecration through fraternal community and serves in the common work of education. The Marianist Brother's radical self-offering reveals Jesus, our Brother, and manifests the kingdom of heaven. A Marianist Brother is a man called by God to intensify his baptismal consecration by special vows that imitate the chaste, poor, and obedient Christ. He is called to sacrifice worldly pursuits and live an intimate, exclusive relationship with the Lord. 1. Always begin with data, with what we know for sure. Judge the unknown by the known, the uncertain by the certain. Adam and Eve neglected that principle in Eden and ignored God's clear command and warning for the devil's promised pig in a poke. 2. Let your heart educate your mind. Let your love of God educate your reason in discerning his will. The saints understand the Bible better than the theologians, because they understand its primary author, God, by loving him with their whole heart and their whole mind. 3. Have a soft heart but a hard head. We should be "wise as serpents and harmless as doves," sharp as a fox in thought but loyal as a dog in will and deed. Soft-heartedness does not excuse soft-headedness, and hard-headedness does not excuse hard-heartedness. In our hearts we should be "bleeding-heart liberals" and in our heads "stuck-in-the-mud conservatives." 4. All God's signs should line up, by a kind of trigonometry. There are at least seven such signs: (1) Scripture, (2) church teaching, (3) human reason (which God created), (4) the appropriate situation, or circumstances (which he controls by his providence), (5) conscience, our innate sense of right and wrong, (6) our individual personal bent or desire or instincts, and (7) prayer. Test your choice by holding it up before God's face. If one of these seven voices says no, don't do it. If none say no, do it. 5. Look for the fruits of the spirit, especially the first three: love, joy, and peace. If we are angry and anxious and worried, loveless and joyless and peaceless, we have no right to say we are sure of being securely in God's will. Discernment itself should not be a stiff, brittle, anxious thing, but—since it too is part of God's will for our lives—loving and joyful and peace-filled, more like a game than a war, more like writing love letters than taking final exams. Periodically, God calls us to do something that is very hard for us to do. He always supplies us with an ease of conscience and a sense of certainty once we start moving in faith. On October 11th we saw the canonization of five new saints. Among the five was Saint Damian of Molokai. He ministered to lepers and contracted the disease himself. Eventually he died as a result of his work. What a beautiful example of self gift and of love. "Not without fear and repugnance, he chose to go to the Island of Molokai to serve the lepers who were there, abandoned by all; thus he exposed himself to the disease they suffered from. He felt at home with them. The Servant of the Word thus became a suffering servant, a leper with lepers, during the last four years of his life. We recall, faced with this noble figure, that charity makes unity. It gives birth to it and makes it desirable. In following St. Paul, St. Damien leads us to choose the good battle, not those that lead to division, but those that gather together." "He invites us to open our eyes to the lepers that disfigure the humanity of our brothers and today still calls, more than for our generosity, for the charity of our serving presence." "This is the Christian vocation that flows from a proposal of love by the Lord, and that can be realized only thanks to our loving reply. Jesus invites his disciples to the total giving of their lives, without calculation or personal gain, with unfailing trust in God." "The saints welcome this demanding invitation and set about following the crucified and risen Christ with humble docility. Their perfection, in the logic of a faith that is humanly incomprehensible at times, consists in no longer placing themselves at the center, but choosing to go against the flow and live according to the Gospel." "Let us give thanks to the Lord for the gift of sanctity that today shines in the Church with a singular beauty... I would like to invite all of you to let yourselves be drawn by the shining example of these saints, to allow yourselves to be guided by their teachings, so that our whole existence can become a hymn of praise to the love of God." What an invitation by the Holy Father! He invites us to give of ourselves in total and complete sacrifice. Where are you being called on your own journey? What is Christ calling you to? Oh! how He loves us, Oh! how He loves us, Oh! how He loves. 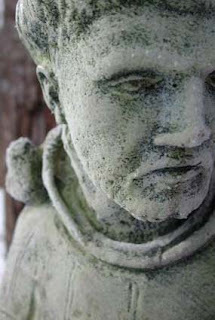 Blessed William Joseph Chaminade, founder of the Marianist Family, encouraged his followers to pause for contemplation. One of the earliest texts defines this spiritual practice as follows: Every day at three o'clock in the afternoon each one makes a short prayer, each one remains standing wherever he may be. The Three O'Clock Prayer makes a difference in our daily routine and educates our spiritual sense. It is a bold prayer. In the midst of a secular world, the Three O'Clock Prayer witnesses the presence of a spiritual reality in our lives. The prayerful halt at three o'clock creates a clear break from business as usual, and sheds critical light on how we deal with secular reality. In the Three O'Clock Prayer we say: "Holy Virgin take us under your protection." Is not this what it is all about? To be under the protection of Mary, who kept all things in her heart, wasting nothing, pondering everything, critically and prayerfully? The prayer goes on: "Holy Virgin open us to the action of the Holy Spirit." The Spirit is the ultimate reason and source of our faith! Last Sunday, the Holy Father canonized Saint Jeanne Jugan in St. Peters. She was the humble foundress of the Little Sisters of the Poor. Born in northern France during the French Revolution—a time when congregations of women and men religious were being suppressed by the national government, Jeanne would eventually be highly praised in the French academy for her community's compassionate care of elderly poor people. When Jeanne was three and a half years old, her father, a fisherman, was lost at sea. Her widowed mother was hard pressed to raise her eight children (four died young) alone. At the age of 15 or 16, Jeanne became a kitchen maid for a family that not only cared for its own members, but also served poor, elderly people nearby. Ten years later, Jeanne became a nurse at the hospital in Le Rosais. Soon thereafter she joined a third order group founded by St. John Eudes (August 19). After six years she became a servant and friend of a woman she met through the third order. They prayed, visited the poor and taught catechism to children. After her friend's death, Jeanne and two other women continued a similar life in the city of Saint-Sevran. In 1839, they brought in their first permanent guest. They began an association, received more members and more guests. 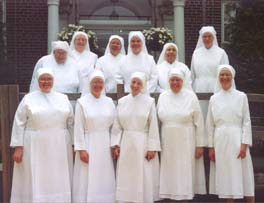 Mother Marie of the Cross, as Jeanne was now known, founded six more houses for the elderly by the end of 1849, all staffed by members of her association—the Little Sisters of the Poor. By 1853 the association numbered 500 and had houses as far away as England. Abbé Le Pailleur, a chaplain, had prevented Jeanne's reelection as superior in 1843; nine year later, he had her assigned to duties within the congregation, but would not allow her to be recognized as its founder. He was removed from office by the Holy See in 1890. By the time Pope Leo XIII gave her final approval to the community's constitutions in 1879, there were 2,400 Little Sisters of the Poor. Jeanne died later that same year, on August 30. Her cause was introduced in Rome in 1970, and she was beatified in 1982 and canonized Saint Jeanne Jugan on October 11. Catacombs were stone-walled underground cemeteries, usually for one or more wealthy Roman families. In that sense, Saint Priscilla's catacombs on the Via Salaria, are really no different than many others in the city of Rome. However, painted on the walls of these catacombs are numerous frescos dated to the 2nd and 3rd centuries AD. 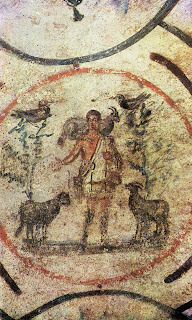 On the ceiling of a niche dug out from the upper wall of a gallery is the Good Shepherd, a symbol of Christ amid trees with stucco trunks with painted branches bearing red and green flowers. Also, an image of the Madonna and Child with a prophet pointing to a star. "A star shall come forth out of Jacob, and a sceptre shall rise out of Israel." 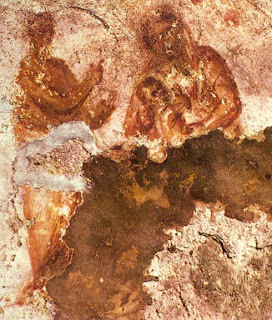 The style of the fresco and its location contribute in dating the image to the beginning of the third century A.D. making it the oldest known image of the Mother of God. Periodically you can watch a posted Youtube and be surprised at who you see. Take a look at this video and you will see three of our Brothers who attended the Rosary with the Pope on Saturday, October 10. Visible (.09) are Father Francis, Brother Peter, Brother Michael John and Brother Michael Joseph who were in Rome for the Canonization of St. Jeanne Jugan, foundress of the Little Sisters of the Poor. The Pope called on college students to build universities of high intellectual learning and to sincerely and passionately pursue the truth. During the rosary, which was part of the Synod of Bishops for Africa, Pope Benedict was connected via satellite with eight African countries. In the end, he encouraged universities to collaborate culturally and scientifically, and to provide special assistance to African women. The Pope said, “To you, dear African students, I address a special invitation to experience the time of study in preparation for developing a cultural awakening service in your country”. Pope Benedict prayed the Rosary on Saturday with and for Africa. Joining the Pope were African and Italian students at the Vatican as part of the second meeting of the Synod of African bishops. 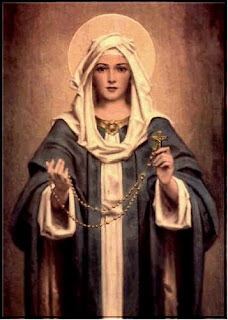 The mysteries of the Holy Rosary, predominantly a scriptural prayer, are taken from the New Testament and focus on the magnificent events of the Incarnation and Redemption. Pope Benedict said, 'The Rosary is experiencing a new Springtime. Without a doubt, this is one of the most eloquent signs of love that the young generation nourish for Jesus and his Mother, Mary. In the current world, so dispersive, this prayer helps to put Christ at the centre, as the Virgin did, who meditated within all that was said about her Son, and also what he did and said. When reciting the Rosary, the important and meaningful moments of salvation history are relived." We all live very busy lives, there is no way to deny this simple fact. Yet it is difficult to imagine how much we do in a single day. Whether it is work or family, children or errands, cooking or homework...just the simple daily obligations we have fill every waking moment of our days. 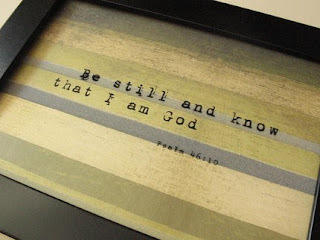 And yet God calls us to stop, to be STILL, and to KNOW that HE is GOD! To be still, is to quiet not only or surroundings but our mind. To stop the noise and listen...in silence. We don't often like silence, it can make us uncomfortable. All of the things our "busyness" keeps out of our thoughts come rushing to the forefront. We immediately seek the refuge of our schedules and the next things on our lists. But silence is essential for one to hear the voice of God. So turn off those iPods and TVs. Log off the computer and power down those cell phone. Today try to make time, even if it is just five minutes, to BE STILL. Maybe stop by church and pray before our Lord in the tabernacle, find a quiet spot outside and witness the beauty of His creation, or even find a quite room in the house to just take a moment to meditate. For those who believe that they just don't have the time to spare, remember this, we always make time for the important things in our lives, then how can we not make time for Him. Be Still...Listen Carefully...You might be surprised what you hear! Once again, hitting the charts at our school for the top ten contemporary Christian Music videos is Chris Tomlin. He is one of the leading artists and activist within contemporary Christian music. Tomlin is a successful singer and songwriter whose 2005 album Arriving has sold over 500,000 copies, and whose compositions "Holy Is the Lord" and "How Great Is Our God" are among the most popular contemporary songs. Born in Grand Saline, TX, in 1972, Tomlin grew up listening to country music and learned to play guitar from his father. At the age of nine, Tomlin accepted Jesus Christ as his savior. Tomlin originally enrolled at Texas A&M in the early '90s to study medicine, but God had other plans for him. Blessed Father Chaminade understood Christ to be the mystery of the Son of God, become Son of Mary for the salvation of all. For Fr. 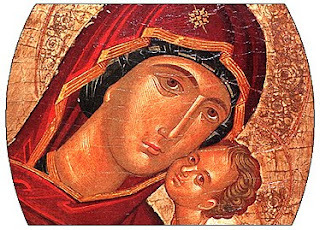 Chaminade, the best way for christians to come to an intimate relationship with Jesus was through his mother Mary. Between Jesus and Mary, Father Chamiande taught, existed an unsurpassed intimacy and spiritual union that inseparably united Mary to all his mysteries. Just as Mary is Mother of God, she too, is the mother the Church, the mystical body of Christ. Thus Mary becomes our mother. Finally for Blessed Chaminade, in order to assist in Mary's mission of bringing her children to her son, Mary must be known in order to be loved and served. May we always love and serve our Mother Mary, that we may know, love and serve her son, Our Lord Jesus Christ! For everything must die to rise again! Jeanne Jugan in her youth became a servant and friend of a woman she met through a third order. They prayed, visited the poor and taught catechism to children. After her friend's death, Jeanne and two other women continued a similar life in the city of Saint-Sevran. In 1839, they brought in their first permanent guest. They began an association, received more members and more guests. Mother Marie of the Cross, as Jeanne was now known, founded six more houses for the elderly by the end of 1849, all staffed by members of her association—the Little Sisters of the Poor. By 1853 the association numbered 500 and had houses as far away as England. By the time Pope Leo XIII gave her final approval to the community's constitutions in 1879, there were 2,400 Little Sisters of the Poor. Jeanne died later that same year, on August 30. Her cause was introduced in Rome in 1970, and she was beatified in 1982 and canonized in 2009. One of the greatest paradoxes of our faith is that in order to discover true freedom we must learn to surrender. If we understand the goal of the Christian life to be far more than just ceasing destructive or sinful behaviors, the goal becomes transformation. To live as a new creation, a life devoted to becoming like Christ. It is in that surrender, we receive the grace to abandon a life of selfishness and embrace a life of selflessness. As we begin the process of slowly surrendering all to God we find the peace, joy, freedom, and purpose that God intended for us. Take a moment to listen to this week’s meditation song and pray for the ability to surrender. "I'm letting go of myself. I'll say so long to everything else. I just want to be in your arms. Moving ever closer to your heart." ...One of the things that makes the least sense to me is how timid most Catholics are about Reconciliation. Yes, I know it’s an elephant in the Cathedral - who doesn’t get skittish talking about their own sinfulness? I’m amazed, though, how many faithful Mass-going Catholics I run into that go to Confession once or twice a year! Really? Maybe it’s just that I sin a lot more than everyone else, but I couldn’t stay away from the Sacrament that long. We tend to think of Confession as emergency surgery; it’s something we turn to when we’ve made a big mistake and need to be fixed up. But Confession is a lot more like taking your vitamins - something that’s done on a regular basis. Even if you aren’t neck-deep in mortal sin, Confession is still valuable because of the grace it gives. You aren’t simply having your sins forgiven when you step into that box... you’re receiving grace upon grace to avoid sin in the future. 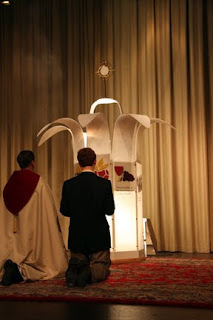 In the same way that habitually receiving the Eucharist transforms us to be like Christ, going to confess our sins actually moves us in the direction of holiness. 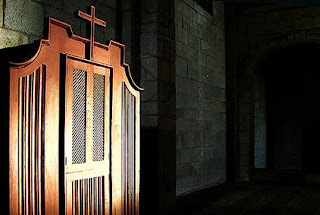 Take a second to think about what the Sacrament of Confession is: Jesus is sitting next to you, hearing you pour out the ways you’ve sinned, and then forgiving each of them. He erases them into non-existence. And it’s free... the only price is paid in the humility to admit our mistakes. If you haven’t been this month, this semester, or this year - get to Confession. Look up a time this Saturday. Your parish might even have weekday opportunities. Or pick up the phone and make an appointment - don’t be scared. We could all use a little more time in the box. Blessed William Joseph Chaminade gathered together a number of young men and women and formed a "community" of mutual support. In 1804, he established the permanent headquarters for his work in the former chapel of the Madelonnette Sisters. The site became the center of the Sodality of the Madeleine. 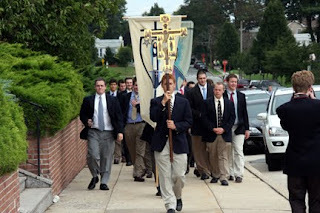 Chaminade's concept of the Sodality was to gather all Christians into a unique community of Christ's followers unafraid to be known as such, committed to living and sharing their faith, and dedicated to supporting one another in living the Gospel to the fullest. Sodalities in our local schools has begun with their Opening Prayer services. 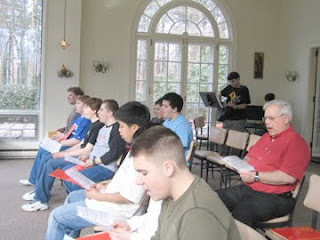 Above, Sodalists gather in the Chapel during Adoration for their first meetings. Matt Maher always tops the charts among Christian Music Videos. Each summer we are exposed to his prayerful and engaging music at the Life Teen Leadership Conference. We have had his musicial gifts at both of our high schools for prayer and concert. This song is one that always tops the charts. Take time to listen to this one! 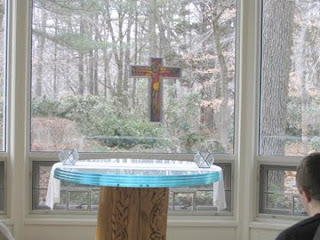 The Meribah chapel houses the one main "table" in the retreat house. 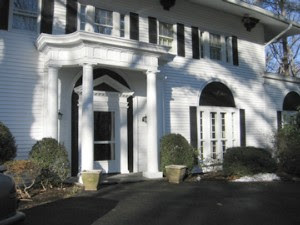 Morning, evening and night prayer, private reflection and the celebration of the Eucharist are the hallmarks of this retreat house that celebrates 39 years today. October is Respect Life month since 1972! "God’s creation is one and it is good. The concerns for non-violence, sustainable development, justice and peace, and care for our environment are of vital importance for humanity. 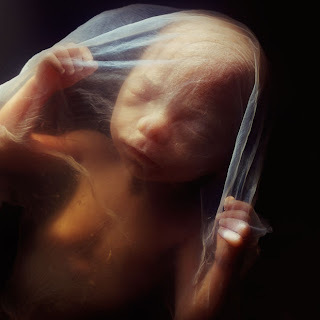 They cannot, however, be understood apart from a profound reflection upon the innate dignity of every human life from conception to natural death: a dignity conferred by God himself and thus inviolable." Today we celebrate the foundation date for the Society of Mary (Marianists). On this date the Marianists commemorate the occasion when the ﬁrst meeting of those who had decided to embrace religious life in a new Institute gathered at Blessed Chaminade’s residence in Villa St. Laurent in 1817. What a tremendous gift we have in St. Therese of Lisieux! She is a stellar example of God’s love in action. She is a powerful example of how much God values each and every one of us. All of us have a place in salvation history, there are no exceptions. Therese had a holy family! Her parents had considered entering into religious life, but it was through their marriage vocation that the world would come to know of the Martin Family. When her father Louis met her mother Zelie he was a thirty-four year old watchmaker, and she was a successful businesswoman making lace. They married in 1858, and were very devoted to the Eucharist. 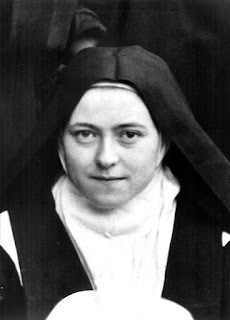 Saint Therese was one of nine children. Two brothers and a sister died in infancy, and her sister Helene died at the age of five.The Martins lived an exemplary Catholic life. Therese's mother was a Third Order Franciscan. Therese and her four surviving sisters all entered into religious life. Four entered Carmel at Lisieux, and one entered the Visitation Convent.